Clean the rust from the surface of the vehicle using rust removing liquids. Also remove any old paint using the paint remover called as thinner. A sand paper can also be used for this purpose. Apply the sand paper on every painted area. It will scratch out the paint from the surface. Surface of your car should be smooth enough to coat paint on it. This smoothness can be achieved by using the sand paper again. Apply the sand paper again on the surface. Use separate and different sand papers for different types of surfaces. Usually a grit paper (220) is used to sand the wooden surface unlike metal surfaces where a 400 grit paper works. Fill the cup of the gun with the respective primer. Close it and test if the primer is being sprayed properly or not. A coating standard is that your gun should spray an area of six square inch from a distance of six inches. You can achieve this standard by tuning the nozzle of the gun. 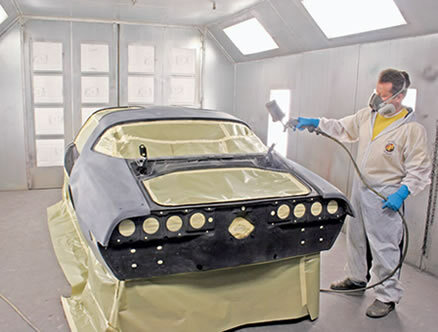 Use a primer reducer or a thinner to reduce the thickness of the coat. Start applying the base coat on the surface of the car now. Spray the surface from a distance of six inches in an up/down or back/forth motion. You must paint from a distance of six inch to apply a regular coat. On finishing ensure that you have applied a perfect coat without sags, drips and voids. Now softly apply sandpaper on the paint again. Each surface should be sanded with its respective sand paper as mentioned before. Allow the coat to dry. If you think you haven’t achieved good results, spray the surface again.